Giovanni Placido Agostino Pascoli, who was regarded as the greatest Italian poet writing at the beginning of the 20th century, was born on this day in 1855 in San Mauro di Romagna, then part of the Kingdom of Sardinia. Pascoli’s poems in Latin won prizes and he was regarded by the writer Gabriele D’Annunzio as the finest Latin poet since the Augustan age, which lasted from approximately 43 BC to AD 18 and was thought to be the golden age of Latin literature. Although Pascoli was the fourth of ten children, his family were comfortable financially and his father, Ruggero Pascoli, was administrator of an estate of farmland on which they lived. But when Giovanni Pascoli was just 12 years old, his father, returning from Cesena in a carriage drawn by a black and white mare, was shot and killed by an assassin hiding in a ditch at the side of the road. The mare carried on slowly and brought home the body of her master, Ruggero, but the murderer was never brought to justice. Giovanni Pascoli’s mother died the following year and five other children in the family had also died before he became an adult. 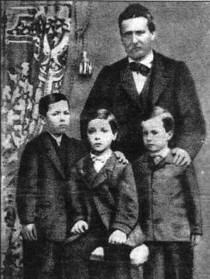 In 1871 Pascoli moved to live in Rimini with some of his siblings, where he began to join in with Socialist demonstrations. He was briefly imprisoned in Bologna for preaching political anarchy after a protest against the capture of the anarchist Giovanni Passannante, who had tried to kill King Umberto I.
Pascoli composed an Ode to Passannante, but he tore it up soon after reading it during a Socialist gathering in Bologna. He had been studying at the University of Bologna under the poet, Giosuè Carducci, but after his imprisonment he began a career in teaching, first in secondary schools and then in universities, as a professor of Greek, Latin and Italian literature. In 1905 he was appointed to the Chair of Italian Literature at Bologna. 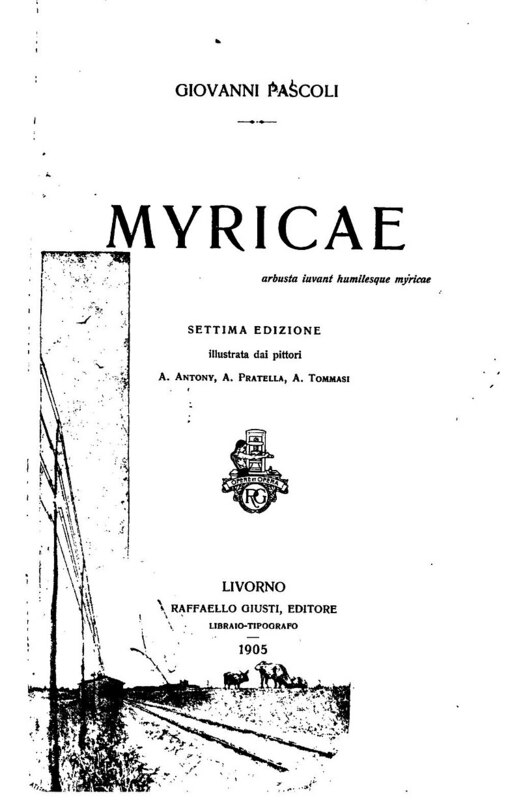 Pascoli’s first literary work, Myricae, was a collection of short, delicate lyrics inspired by nature and reflecting the psychological unrest of his student years. His best work is considered to be Canti di Castelvecchio, a collection of moving songs about his sad childhood that also celebrated nature and family life. 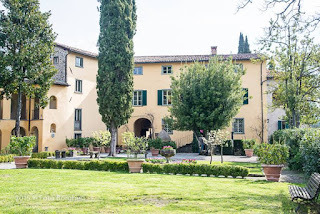 These were written at the home in Castelvecchio di Barga - now known as Castelvecchio Pascoli - in Tuscany that he shared with his sister Maria after 1895. In his later years, Pascoli wrote nationalistic and historic poetry such as Poemi del Risorgimento, published in 1913. The way he focused on small things in his poetry and scaled back on the era’s grandiose language and rhetoric is thought to have contributed to the modernisation of Italian poetry. His poems were translated and published in English in the 1920s and he also translated poems by Wordsworth, Shelley and Tennyson into Italian. 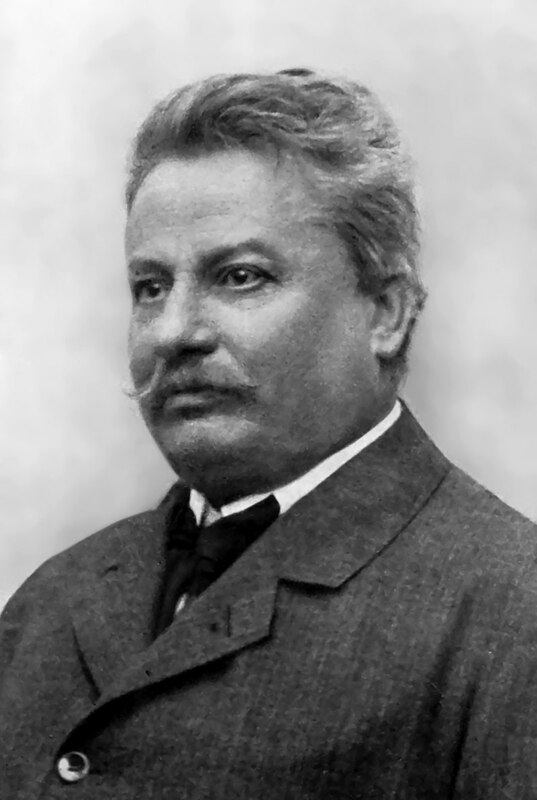 Pascoli died in 1912 at the age of 56 in Bologna. 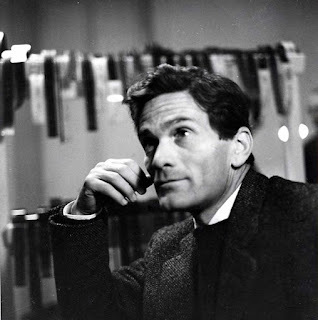 An Italian literary award, the Pascoli Prize, was established in 1962 to commemorate the 50th anniversary of his death and his birthplace was renamed San Mauro Pascoli in 1932 in his honour. 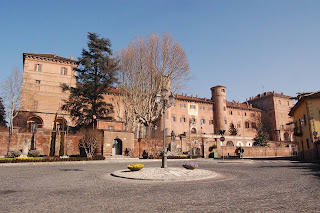 San Mauro Pascoli, renamed to honour the poet, is a town in what is now the province of Forlì-Cesena in the Emilia-Romagna region, about 100km (62 miles) southeast of Bologna and just 7.5km (4.7 miles) from the sea. The Italian shoe designer Giuseppe Zanotti was also born there. 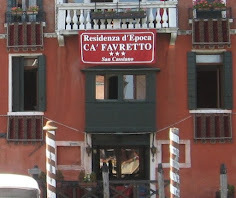 Pascoli's family home, in what is now Via Giovanni Pascoli, is open to the public as a museum. For more information visit www.casapascoli.it. 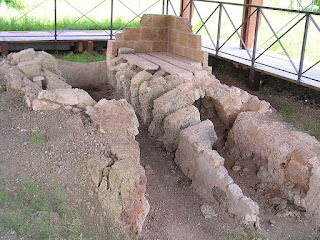 The town is also notable for the remains of Roman brick furnaces discovered during the construction of the Romagnolo Emiliano Canal. Giovanni Pascoli’s house in the hamlet of Castelvecchio Pascoli is also now a museum dedicated to his life and work. After the poet’s death in 1912, his sister, Maria, took care of the house, faithfully preserving its structure and original furnishings. 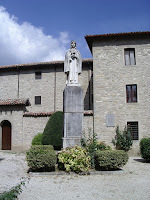 She left the house to the Municipality of Barga in her will and it has since been declared a national monument. In the chapel, which had been restored by Pascoli himself, Maria was laid to rest after her death in 1953, next to her brother. The tennis player Camila Giorgi, currently the highest-ranked Italian in the female world rankings, was born on this day in 1991 in Macerata, a city in the Marche region. Giorgi, the Italian No 1, rose to 26 in the latest Women’s Tennis Association world rankings, her highest position to date. There is no other Italian woman in the top 100. This has been a breakthrough year for Giorgi in that she reached the quarter-finals of a Grand Slam event for the first time, at the Wimbledon Championships in London in June. Giorgi was not seeded but after defeating 21st seed Anastasija Sevastova in the first round, she advanced through her section of the draw with three more victories, culminating in a straight-sets win over former world No 8 Ekaterina Makarova in the fourth round. That earned Giorgi a last-eight meeting with seven-times Wimbledon champion and world record grand slam winner Serena Williams. Giorgi won the first set but Williams fought back to win the match. Earlier in the 2018 summer, Giorgi had delivered her best performance at the French Open by reaching the third round. Later in the year, she won her second career WTA tournament, the Linz Open in Austria. Although Giorgi has never beaten Serena Williams in four encounters, she has an unusually good record against top players. In the course of her career, Giorgi has beaten former World No 1 players Maria Sharapova, Victoria Azarenka, Caroline Wozniacki, Garbiñe Muguruza and Karolina Pliskova, double Wimbledon champion Petra Kvitova, two French Open champions in her fellow Italian Francesca Schiavone and Jelena Ostapenko, another Wimbledon winner in Marion Bartoli and three US Open champions in Samantha Stosur, Italy’s Flavia Pennetta and Sloane Stephens. Giorgi was born to Argentinian parents of Italian descent. Her parents are Claudia Gabriella Fullone, a fashion designer who designs her daughter’s tennis clothes, and Sergio Giorgi, who is her full-time coach. In 1982, Sergio was drafted into the army of Argentina and fought against the British in the Falklands War. She is one of four children. Her older brother Leandro is studying to be an actor, and younger brother Amadeus is a promising footballer. Sadly, their older sister, Antonela, was killed in a road accident while the family were living in Paris in 2011. They now live at Tirrenia, a resort near Pisa. Giorgi, who was given a placement at Nick Bollettieri’s tennis academy in Florida when she was eight, made her professional debut at the age of 15. She won the first of her five International Tennis Federation tournaments in August 2008. Her first appearance at a Grand Slam tournament came in 2011, when she won through qualifying to make the draw at Wimbledon. She lost her first-round match, but reached the fourth round at Wimbledon the following year, advancing to the same stage at the US Open in 2013, defeating former world No 1 Wozniacki along the way. She made the third round at both the Australian Open and Wimbledon in 2015, during which she scored her first WTA title in Rosmalen, in the Netherlands. At the age of 27, Giorgi has been regularly praised for the power of her hitting and the quality of her ground strokes, but has also attracted comment, not always favourable, for posting glamorous images of herself on her social media accounts and for not yet fulfilling her potential on the court. However, her progress has not been helped by problems with a shoulder injury. Moreover, the age at which tennis players achieve success has changed. Teenage prodigies are no longer common. Giorgi’s age is now the average for female players in the top 50. Also, Italian players are typically late developers. Her fellow Italians Schiavone and Pennetta won Grand Slam titles in their late twenties or early thirties. When Pennetta won the US Open in 2015 she was 33, defeating 32-year-old compatriot Roberta Vinci in the final. Camila Giorgi’s home city of Macerata is in an inland area of Marche, about 48km (30 miles) south of Ancona and 30km (19 miles) from the coastal town of Civitanova Marche. 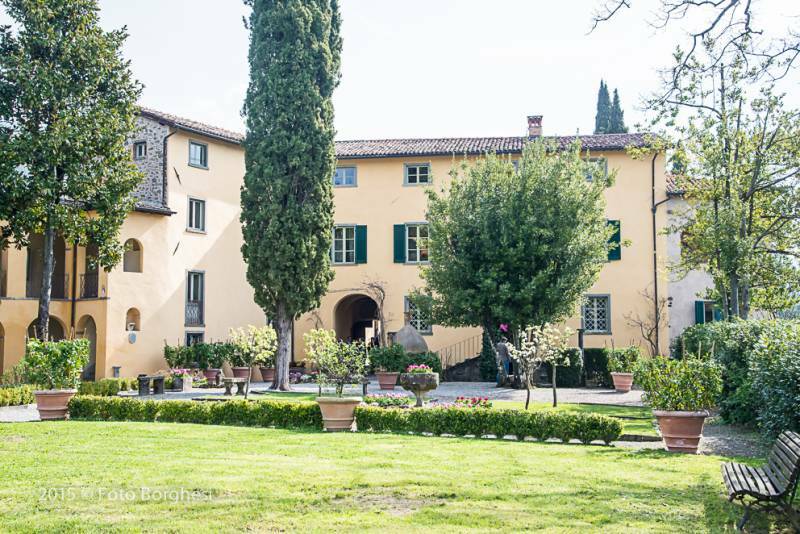 Not a well-known tourist destination, it nonetheless has a charming hilltown feel, with a maze of narrow cobblestone streets and one of Italy’s oldest universities, dating back to 1290. It is the setting each summer for a month-long opera festival at the atmospheric Arena Sferisterio, which has attracted some of the world’s biggest stars. 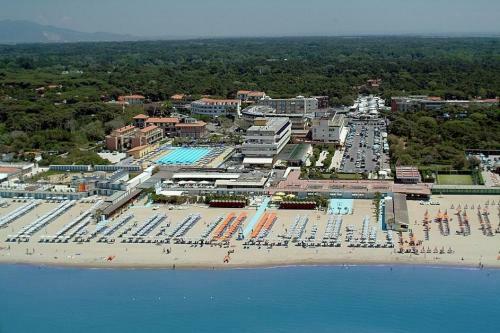 Tirrenia, situated about 20km (12 miles) from the city of Pisa, is an elegant resort surrounded by pine forests. Known for its wide, sandy beaches and clear water, it is well equipped with sports facilities and is a centre for leisure sailing and spearfishing. The forest areas offer walks and cycle paths and has a protected area, the Tirrenia Dune Oasis, which is managed by the Worldwide Fund for Nature as home to a many varieties of flora and fauna and one of the last dune environments in Italy. The sculptor Gaetano Russo, famous for having created the monument dedicated to Christopher Columbus at Columbus Circle in New York, was born on this day in 1847 in the Sicilian city of Messina. Russo’s 13ft (3.96m) statue of the 15th century Genoese explorer, carved from a block of Carrara marble, stands on top of a 70ft (21.3m) granite column, decorated with bronze reliefs depicting the Niña, the Pinta and the Santa Maria, Columbus’s three caravel sailing ships. At the foot of the column there is an angel holding the globe. Unveiled on October 12, 1892 on the 400th anniversary of Columbus’s voyage to the Americas, the statue was a gift to the city from New York’s Italian-American community, funded by a campaign by an Italian-language newspaper, Il Progresso. For the laying of the statue’s cornerstone, a procession took place from Little Italy to what is now called Columbus Circle, at the southern end of Central Park, a distance of 6.5km (4.2 miles). Close to 10,000 people are said to have attended the dedication ceremony. Additional ornamentation around the base of the column depicts Columbus’s journey, American patriotic symbols, and allegorical figures. The monument was restored in 1992 on the occasion of the 500th anniversary of his transatlantic crossing. 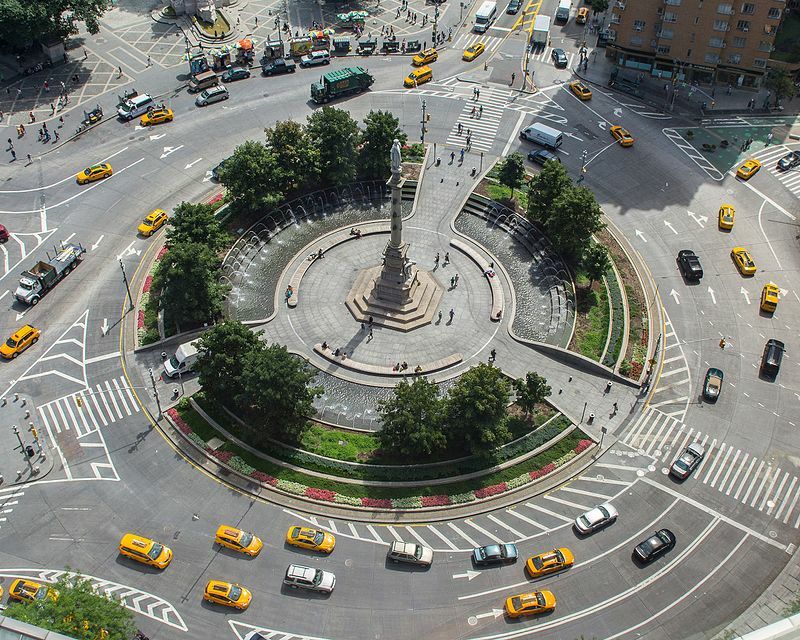 Columbus Circle, at the intersection of Broadway, Central Park West, Central Park South (West 59th Street) and Eighth Avenue, has a symbolic importance to New Yorkers, as the traditional geographic centre of the city. For decades, the Hagstrom Map Company sold maps that showed the areas within 25 miles (40km) or 75 miles (121km) of Columbus Circle. Even today, the New York City government employee handbook defines 'long-distance travel' as a trip beyond a 75-mile (121km) radius of Columbus Circle. The monument came under threat in 2018 as part of a nationwide review of whether figures regarded traditionally as American heroes, and who were celebrated in statues and other monuments, deserved their status. Columbus was controversial for having taken back indigenous people from the Caribbean to sell in Spain as slaves and there were calls for the statue to be taken down. However, after Governor of New York Andrew Cuomo, who is descended from Campanian immigrants, had spoken out on behalf of his fellow Italian-Americans in upholding the importance of Columbus in the links between the two countries, it was announced that the statue would stay in place but that there would be notices placed in or around Columbus Circle explaining the history of Columbus and of the monument. Gaetano Russo was born in Via dell’Oliveto in Messina and baptised in the nearby church of San Leonardo. Little is known about his early life until 1870, when he received a grant to go to Rome where he studied with Girolamo Masini and Giulio Monteverde. He worked in both Rome and his native Sicily. In the capital he was commissioned to sculpt bas-reliefs for the facade of the building that now houses the Academy of Dramatic Art, the pediments of the Policlinico Umberto I and the cenotaph dedicated to Felice Bisazza. In Messina he was commissioned to make funerary sculptures for the monumental cemetery and the monument to Marco Miceli Puglisi, dated 1877, on which stands an imposing winged figure. 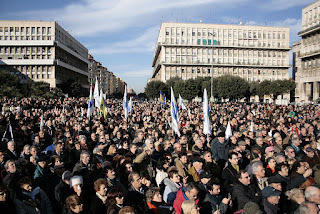 No record of Russo exists after 1908 and it is assumed that he died in the devastating earthquake of the same year that destroyed much of Messina and may have killed up to 200,000 people. It is known that his brothers, Letterio and Stellario, both perished and that all the buildings in and around Via dell'Oliveto, a heavily populated area of ​​the city, disappeared. 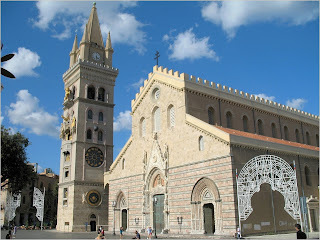 Messina is a city in the northeast of Sicily, separated from mainland Italy by the Strait of Messina. It is the third largest city on the island and is home to a large Greek-speaking community. 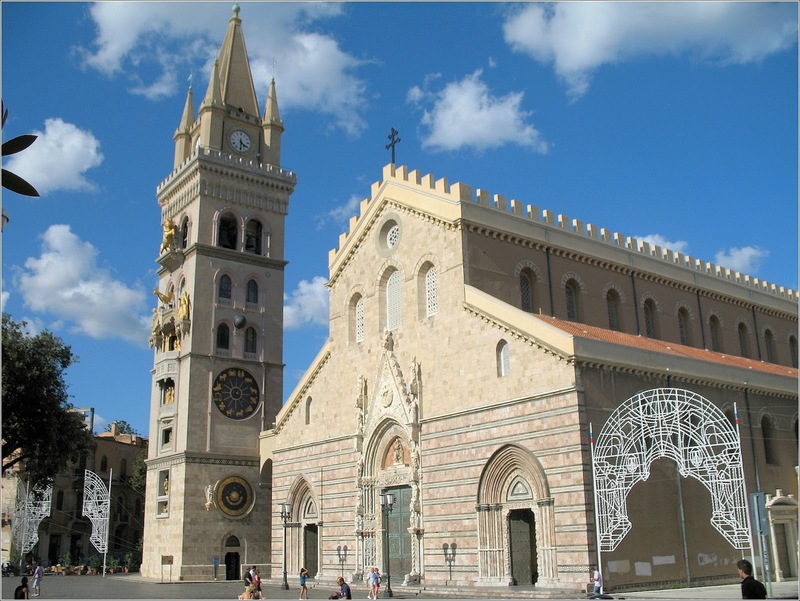 The 12th century cathedral in Messina has a bell tower which houses one of the largest astronomical clocks in the world, built in 1933. Originally built by the Normans, the cathedral, which still contains the remains of King Conrad, ruler of Germany and Sicily in the 13th century, had to be almost entirely rebuilt following the earthquake in 1908, and again in 1943, after a fire triggered by Allied bombings. Located in the San Lorenzo quarter, the Policlinico Umberto I of Rome, where Russo sculpted the bas relief figures decorating the pediment over the main entrance, is the polyclinic of the faculty of medicine and surgery of the Sapienza Università di Roma. The city’s main hospital, it is the second largest public hospital in Italy. Its construction was promoted by Italian physicians and politicians Guido Baccelli and Francesco Durante and began in 1883 to plans by Giulio Podesti and Filippo Laccetti. The opening was presided over by the then university rector Luigi Galassi and by King Umberto I, after whom it is named. The operatic tenor Francesco Tamagno, most famous for singing the title role at the premiere of Giuseppe Verdi’s Otello at Teatro alla Scala in Milan in 1887, was born on this day in 1850 in Turin. Tamagno, whose powerful voice and range put him a category of singers known as heroic tenors by being naturally suited to heroic roles, developed a reputation that enabled him to command high fees around the world and amass a considerable fortune. During a career that spanned 32 years from his debut in 1873 to his premature death at the age of 54, Tamagno sang in some 55 operas and sacred works in 26 countries. In addition to his association with Otello, he also was the first Gabriele Adorno in Verdi's 1881 revision of Simon Boccanegra, and appeared in the premiere of Verdi's Italian-language version of Don Carlos when it was staged at La Scala in 1884. Five other operas in which Tamagno is acknowledged as the creator of leading roles include Carlos Gomes' Maria Tudor, Amilcare Ponchielli's Il figliuol prodigo and Marion Delorme, Ruggero Leoncavallo's I Medici and Isidore de Lara's Messaline. 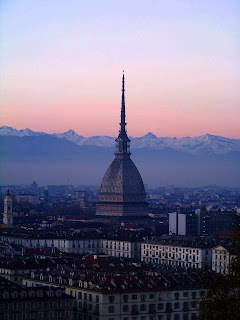 From a large family in the Borgo Dora area of Turin, Tamagno was the son of a wine seller who also kept a small trattoria. He took music lessons at the city’s Liceo Musicale from the conductor and composer Carlo Pedrotti, who was able to arrange for him to sing some small parts at Turin's Teatro Regio, of which he was the director. 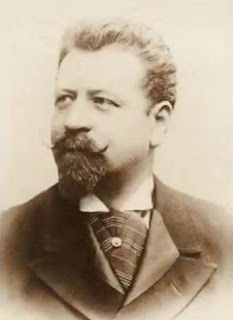 One of Tamagno's earliest opportunities to perform in a major role came in January 1874 at the Teatro Bellini in Palermo, where he attracted considerable attention for an outstanding performance as Riccardo in Verdi's Un ballo in maschera. Quickly given more engagements, he made his debut at La Scala in 1877, as Vasco de Gama in Giacomo Meyerbeer’s L’Africaine. 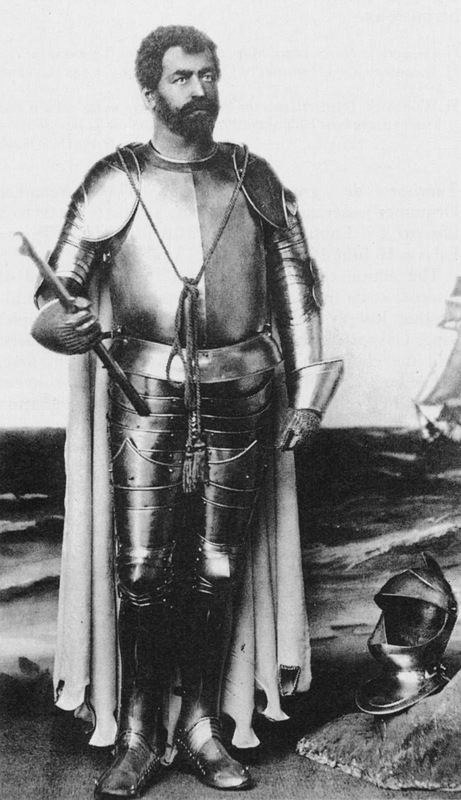 Over his career, Tamagno was lauded for his interpretations of many established parts, such as Manrico in Il trovatore (Verdi), Don Alvaro in La forza del destino (Verdi), the titles role in Ernani (Verdi) and Poliuto (Gaetano Donizetti), Arnold in Guillaume Tell (Gioachino Rossini), John of Leyden in Le prophète (Meyerbeer), Raoul in Les Huguenots (Meyerbeer), Vasco in L'Africaine, Robert in Robert le diable (Meyerbeer) and Eleazar in La Juive (Fromental Halévy). Conductors of the standing of Franco Faccio, Luigi Mancinelli and Arturo Toscanini toured with Tamagno, who appeared opposite some of the most illustrious sopranos, baritones and basses in operatic history. 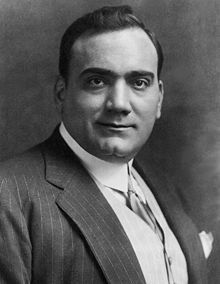 He witnessed the rise to fame of Enrico Caruso, predicting that the young Neapolitan would go on to become the leading Italian tenor of the 20th century. Tamagno and Caruso actually appeared on the same stage in February 1901, during a concert at La Scala organised by Toscanini as a tribute to Verdi, who had died the previous month. A big man with a physique to match his powerful voice, Tamagno developed chronic heart problems that caused his health to deteriorate in his late 40s, forcing him to quit the operatic stage. He would appear in concerts but had to give his last in 1904, in Ostend, Belgium. Some recordings were preserved from the last two years of his professional life. He retired to the villa in Varese, Lombardy, that he had owned since 1885, but his health did not improve and died in August 1905, from a heart attack. His body was buried in an elaborate mausoleum at Turin's General Cemetery. Although Tamagno sang in the great opera houses of Barcelona, Paris, Rio de Janeiro, Buenos Aires, New York, London, San Petersburg and Lisbon, he never deserted his roots and would periodically return to his neighbourhood around the Porta Palazzo in Turin, where he would meet up with old friends and give free performances to support local charities. He had a daughter, Margherita, who had been born out of wedlock, but he took a close interest in her upbringing, writing letters to her from around the world as well as willingly giving her financial support. It was she who inherited his estate. Borgo Dora is a small historic district of Turin, just north of Corso Regina Margherita around the Porta Palazzo, bordered to the north by the river Dora Riparia, only a few metres from Piazza Castello at the heart of the city. It is an area with a strong historical identity, the only survivor of the four villages that developed around the old gates of the city. 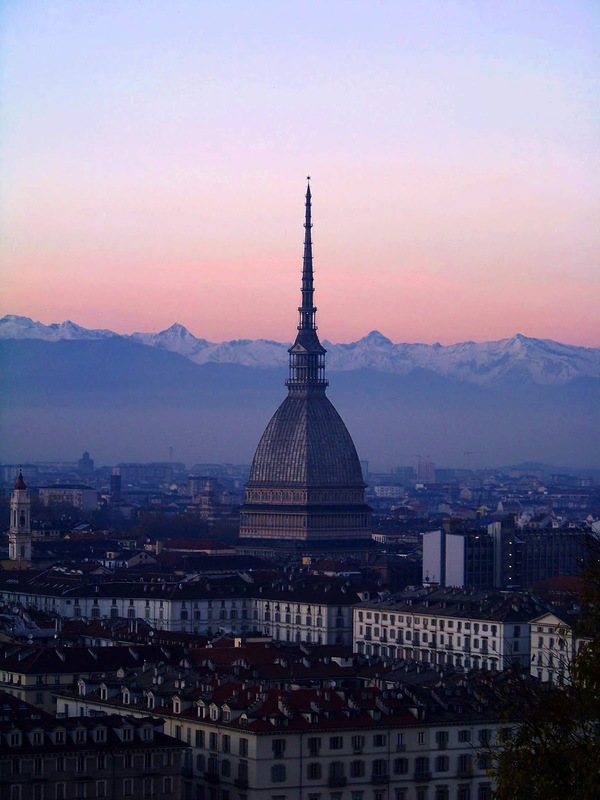 The Via Borgo Dora, which loops around the area in a southeast direction from the Turin Eye, the tethered hot air balloon situated by the river, is a charming cobbled street with many restaurants and antiques shops. The area is also famed for its markets. The Piazza della Repubblica hosts a massive open air market every Saturday, with between 700 and 1,000 stalls, while the area around the Cortile del Maglio is the home to an enormous flea market every second Sunday in the month. Varese, where Tamagno retired to a grand villa, is a city in Lombardy, 55km (34 miles) north of Milan and not far from Lake Maggiore. It is rich in castles, villas and gardens, many connected with the Borromeo family, who were from the area. 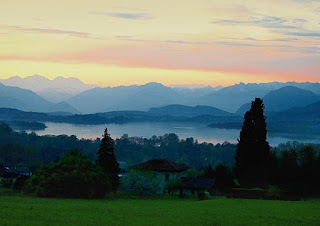 The small Lake Varese is 8.5km (5 miles) long, set in low rolling hills just below Varese. Many visitors to the city are drawn to the Sacro Monte di Varese (the Sacred Hill of Varese), which features a picturesque walk passing 14 monuments and chapels, eventually reaching the monastery of Santa Maria del Monte. 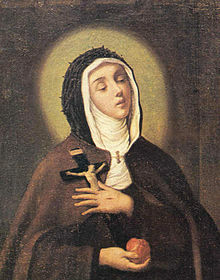 Nun and mystic Veronica Giuliani was born on this day in 1660 in Mercatello sul Metauro in the Duchy of Urbino. After she had spent her whole life devoted to Christ, the marks of the crown of thorns appeared on her forehead and the signs of his five wounds on her body. She was subjected to a rigorous testing of her experience by her bishop but, after he decided the phenomena were authentic, he allowed her to return to normal convent life. The nun was made a saint by Pope Gregory XVI in 1839, more than 100 years after her death. Veronica was born Orsola Giuliani, the youngest of seven sisters. By the time she was three years old she was demonstrating compassion for the poor, often giving away her own food and clothes. 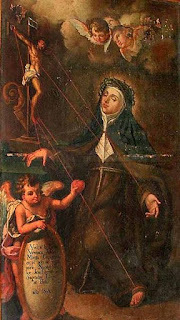 When her father decided she was old enough to marry, she pleaded with him to be allowed to choose a different way of life and, at the age of 17, in 1677 she was received into the monastery of the Capuchin Poor Clares in Città di Castello in Umbria. She took the name of Veronica and lived as a sister in the convent for the next 50 years. Sister Veronica was made novice mistress at the age of 34 and abbess at the age of 55. She improved the life of her fellow nuns by having water piped into the convent as until then they had no supply of fresh water. When the marks of the stigmata appeared on her head and body, Veronica’s bishop removed her from ordinary convent life and kept her under constant observation. It was only when he was satisfied the marks were authentic that he allowed her back into the convent to continue her service. Veronica died in 1727, aged 66, at Città di Castello. After her death a mark representing the cross was allegedly found on her body near her heart. She was beatified by Pope Pius VII in 1804 and canonised by Pope Gregory XVI in 1839. In 1994, a Lebanese man came across her writings and was inspired to found a new religious order. Banners throughout the country proclaimed ‘A Saint rises up in Lebanon’ to herald the first church outside Italy dedicated to Saint Veronica Giuliani. It was consecrated on 9 July 2016, the date of Saint Veronica’s annual feast day. There is a statue of Saint Veronica in the village of Mercatello sul Metauro, her place of birth, which is about 50km (31 miles) south of Pesaro in the Marche region. 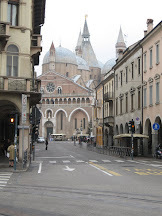 Mercatello’s Gothic Church of Saint Francis dates back to the 13th century and has a fine collection of paintings from the 12th to the 17th centuries. 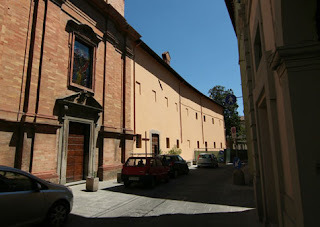 The Capuchin Monastery in Via XI Settembre in Città di Castello is now named after Veronica Giuliani. The body of the saint lies inside an urn under the main altar of the church, which is named after Saint Martin of Tours and dates back to 1208. The church is open to the public from 6.30 to 12.30 and from 3.30 to 6.30 pm each day. A museum has been established on one side of the monastery’s cloister to offer an insight into the life of Saint Veronica and to house her relics. The poet, painter and muscular dystrophy sufferer Piergiorgio Welby, whose wish to be given help to die after nine years being kept alive artificially sparked a huge legal, political and religious debate, was born on this day in 1945 in Rome. Welby, the son of an AS Roma footballer with Scottish ancestry, developed MS when he was 17 years old. Throughout the 1960s and 70s his lifestyle helped keep the disease under control. He lived as an artist and writer, following the hippie movement but also hunting and fishing. His use of recreational drugs dulled the symptoms of the disease and he was able to travel extensively in Europe. During this period he met his future wife, Wilhelmine - later known as Mina - who was from Bolzano province in Trentino-Alto Adige but encountered Welby in Rome. Welby decided in the 1980s to wean himself off drugs by embarking on methadone therapy, but the disease then progressed rapidly and he was soon paralysed from the waist down. In 1997, he suffered severe respiratory problems and from that point onwards was dependent on a breathing tube. As well as mechanical ventilation, he depended on artificial feeding. It was at this point he began to write and talk - he had a voice synthesizer - about euthanasia and joined the Italian Radical Party, the political organisation closest to his views. In time, though, he lost even the ability to control a computer mouse. Euthanasia was and remains illegal in Italy, largely due to the strict opposition of the Catholic Church, and though a patient has a right to refuse treatment, a doctor is still required to make every attempt to keep the patient alive. In September 2006, Welby sparked the political debate that was eventually to bring matters to a head by dictating an open letter to the Italian president, Giorgio Napolitano, which was shown on national television and reported extensively in the national press. “I love life, Mr. President,” Welby wrote. “Life is the woman who loves you, the wind through your hair, the sun on your face, an evening stroll with a friend. Napolitano expressed his sympathy with Welby’s plight and invited politicians to debate the issue. There were heated exchanges in the Italian parliament and political TV shows, around the political, ethical, religious and medical aspects of the case. 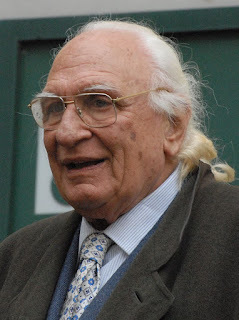 The Radical Party founder Marco Pannella said he was willing to turn off Welby’s life-support equipment himself as an "act of civil disobedience". Most Catholic politicians stood by the official position of the Catholic Church. Health Minister Livia Turco said that a parliamentary debate should focus more on improving palliative care rather than on euthanasia. Welby’s right to refuse treatment under the Italian constitution and the code of conduct of Italian doctors was confirmed by a court ruling, but the doctor’s obligation to try to revive a patient in distress remained in place. Eventually, an anaesthetist, Mario Riccio contacted the Radical Party and said he was prepared to switch off Welby’s life support, seeing no legal impediments. On December 20 he visited him in hospital in the presence of his wife Mina and daughter Carla and some supporters, including Marco Pannella, administered sedation and disconnected all the devices keeping him alive. He was pronounced dead 40 minutes later, at 11.40pm. Welby’s death was announced the following morning by Pannella and a press conference followed later. Luca Volonté, a Christian Democrat, called for Riccio to be arrested and charged with murder and had strong support in public opinion polls, but the the following March both the Ethical Committee of the Italian Medical Association and investigating magistrates declared Dr Riccio’s conduct to be lawful. Controversially, the Catholic Church refused to allow Welby a religious funeral, declaring that his repeated public affirmations of his desire to end his own life were against Catholic doctrine. 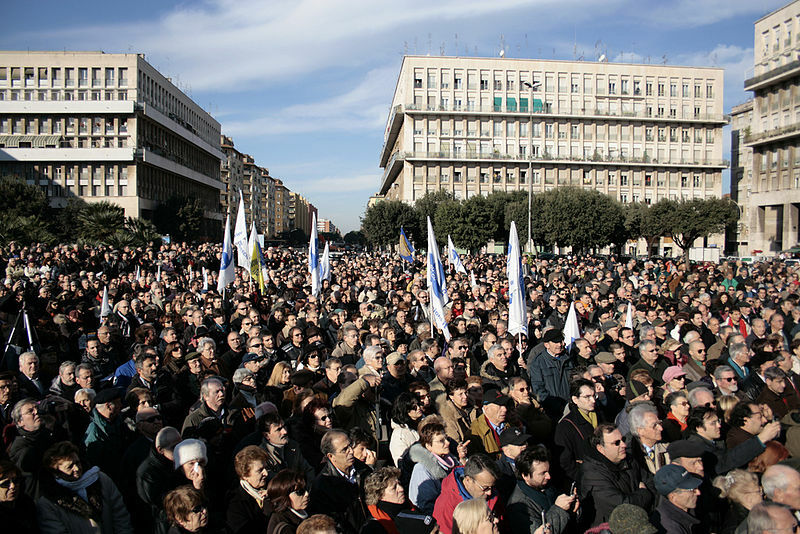 Nonetheless, up to 1,000 people attended a secular funeral on December 24, 2006 in Piazza Don Bosco in the Tuscolano quarter of Rome, in front of the church that the family had chosen for the religious ceremony. Mina Welby’s home town of San Candido, also known as Innichen, is in northern Italy, close to the border with Austria. It’s part of the Tre Cime Natural Park, in the Dolomites. 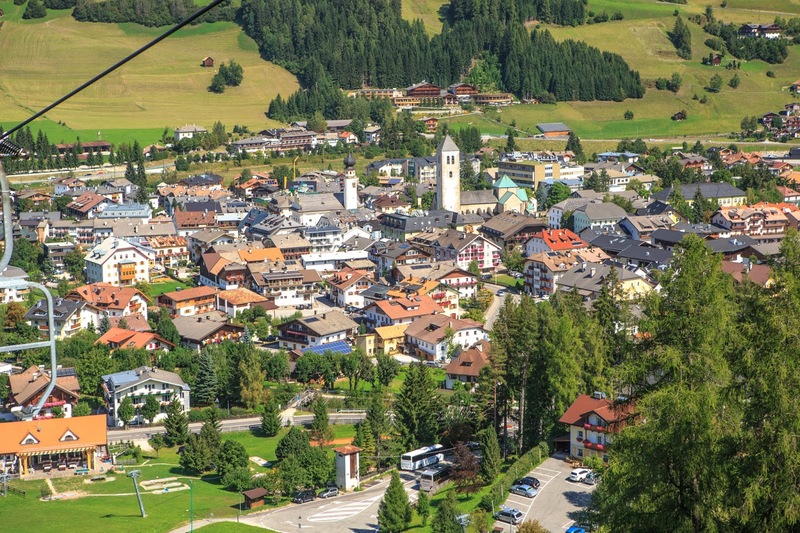 Among the main sights in the historical centre is the Romanesque-style Innichen Abbey, with a frescoed dome, and the DoloMythos Museum, exploring local natural history. The area has a strong military history, being home to the Druso and Cantatore barracks, the latter housing the 6th Alpine Regiment of the Italian Army. A short distance outside San Candido is a sanctuary where the bodies of more than 200 soldiers killed in the First World War were buried. Tuscolano is the 8th quartiere of Rome and is named after the Via Tuscolana that runs through it. It is one of the biggest districts of Rome, starting just outside the old city walls, near the Basilica of San Giovanni in Laterano, and stretches all the way to the Via del Quadraro in the east. 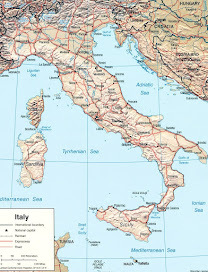 Its northern border is the Via Casilina and its southern border is the Via Appia Nuova. 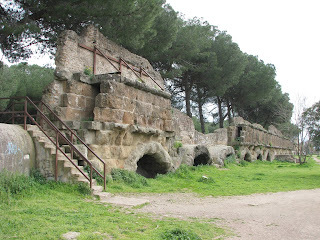 The Via del Mandrione is lined by huge walls that supported five of the ancient Roman aqueducts - the Aqua Marcia, Aqua Tepula, Aqua Iulia, Aqua Claudia and the Anio Novus. The singer-songwriter Marco Mengoni, who rose to fame after winning the Italian version of the TV talent show The X-Factor, was born on this day in 1988 in Ronciglione in northern Lazio. Mengoni triumphed in the 2009 edition - the third series of X-Factor on the public service channel Rai Due before it was bought up by subscription channel Sky Italia - during which he unveiled what would be his debut single, Dove si vola, which he sang for the first time at the semi-final stage. 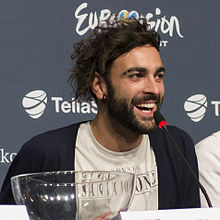 The single, an example of the sophisticated pop-rock style that would become Mengoni’s trademark, reached number one in the Italian downloads chart while a seven-track extended play album of the same name sold 70,000 copies, peaking at nine in the Italian albums chart. Mengoni’s performances on The X-Factor had received favourable comments from both Mina and Adriano Celentano, the all-time bestselling artists in Italian popular music history. The prize for winning The X-Factor was a recording contract with a value of €300,000 and automatic selection for the 2010, Sanremo Music Festival 2010, in which he finished third with Credimi ancora. The single was included in Mengoni’s second EP, Re matto, which topped the Italian singles chart. His first full-length solo album, Solo 2.0, went straight to number one in the Italian albums chart when it was released in September 2011. Whereas he had previously sung mostly compositions written by others, the tracks on Solo 2.0 were almost all co-written by Mengoni. After spending much of 2012 touring, Mengoni entered Sanremo again in 2013 and this time won, with L’essenziale, which he wrote in collaboration with Roberto Casalino and Francesco De Benedettis. L’essenziale was the lead single from Mengoni's second studio album, #prontoacorrere, It debuted at number one on the FIMI Singles Chart and downloads exceeded 120,000. It was the top selling track of the year by an Italian artist. The song was also selected as Italy’s entry for the 2013 Eurovision Song Contest in Malmo, Sweden. Mengoni finished seventh - well behind the winner, Denmark’s Emmelie de Forest (Only Teardrops) - but the song caught the imagine of viewers and gained him many new fans outside Italy. Since then, Mengoni has released three more studio albums - Parole in circolo and Le cose che non ho in 2015 and, this autumn, Atlantico - plus a live album, Marco Mengoni Live, a 2016 double album that included five previously unreleased studio tracks. Atlantico has been top of the Italian album chart for four weeks, giving Mengoni a Christmas number one. 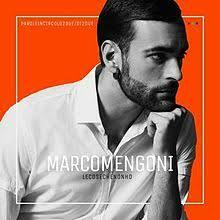 Mengoni grew up in Ronciglione, which is about 60km (37 miles) north of Rome, near Lago di Vico. At the age of 14, while a design student at secondary school, he took singing lessons. He soon tasted the experience of singing before an audience after his teacher invited him to join a vocal quintet which performed in piano bars and clubs. He embarked on a solo singing career at 16, assembling a group of backing musicians to perform in small clubs, mixing covers with his own songs. At 19 he moved to Rome to study languages at university. His big break in The X-Factor came a year later. 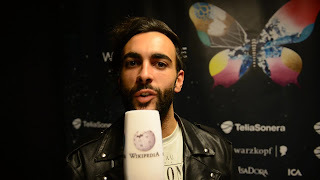 Among Mengoni’s other achievements, he was the first Italian artist to win Best European Act at the MTV Europe Music Awards - in 2010 and 2015 - and the first Italian artist to perform at the Billboard Film & TV Music Conference in Los Angeles, in 2013. Today, Mengoni lives in Milan. In 2019, he embarks on a 16-date European tour, between April and May, beginning with shows in Germany, Switzerland and France, following by 12 appearances in Italy. On May 25 and 26 he is scheduled to perform at the Arena di Verona, the Roman amphitheatre that has become one of Italy’s most prestigious concert venues. 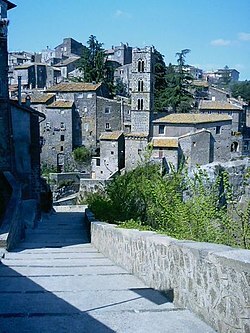 Ronciglione, known locally as Ronció, is a town about 20km (12 miles ) from Viterbo located in the Cimini mountains, on the southeast slope of the former volcano crater now housing Lake Vico. The main sights include a well-preserved medieval centre, a castle originally built in the middle ages, with characteristic angle rounded towers, and a Baroque cathedral designed by Pietro da Cortona, rebuilt by Carlo Rainaldi between 1671 and 1695. The bell tower is from 1734. The cathedral houses a Tryptych of Christ by the Viterbese painter Gabriele di Francesco. Ronciglione is known for its carnival and the Palio of the Manna, which features riderless horses competing for each of nine contrades (parishes). The Arena di Verona in Piazza Bra is a wonderful surviving example of a first-century Roman amphitheatre, which has now become a famous location for large-scale, outdoor productions of opera each summer. The arena was built in in AD 30 on a site which was then beyond the city walls. 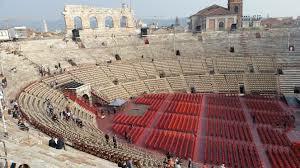 It could host more than 30,000 spectators in ancient times, double the capacity permitted today. It was thanks to the enthusiasm of the tenor Giovanni Zenatello and the impresario Ottone Rovato in the early part of the 20th century that operatic performances became the arena’s staple. They put on a staging of Giuseppe Verdi's Aida in August 1913, to mark the birth of Verdi 100 years before in 1813. 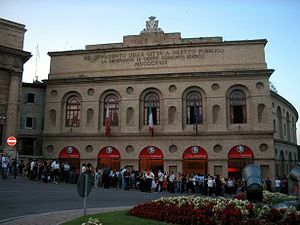 Musical luminaries such as Puccini and Mascagni were in attendance and since then summer seasons of opera have been mounted continually at the arena, apart from during the war years. Opera composer Domenico Sarro was born on this day in 1679 in Trani, a seaport north of Bari in Apulia. He was given the middle name, Natale, which is the Italian word for Christmas. Sarro is famous for being the composer of Achille in Sciro, the opera chosen for the opening night of the new Teatro San Carlo in Naples in 1737. He studied music from the age of six at Sant’Onofrio, a church near Porta Capuana, one of the ancient city gates of Naples, which at the time was the location of the city’s music conservatory. 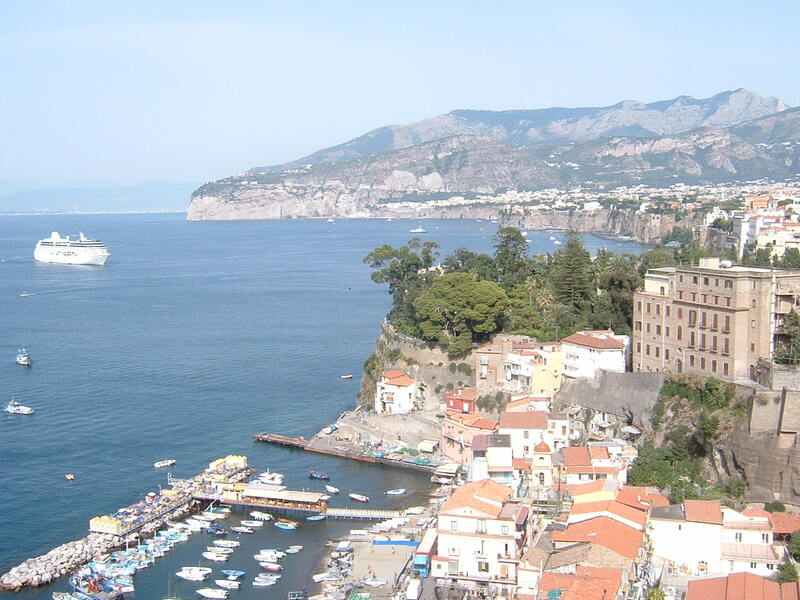 His first opera, L’opera d’amore, was performed in Naples in 1702. He was appointed assistant choirmaster to the Neapolitan court in 1702 and by 1706 was having his religious music performed in churches in Naples. He wrote several of what were then referred to as three-act musical dramas, which were performed in theatres and private palaces throughout the city. 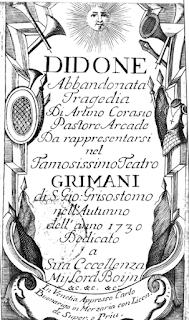 Sarro’s opera, Didone abbandonata, was premiered on February 1, 1724 at the Teatro San Bartolomeo in Naples. It was the first setting of a major libretto by the writer Pietro Metastasio, who would become the most celebrated librettist of the 18th century. The intermezzo, Dorina e Nibbio or L’impresario delle canarie, has been performed extensively by orchestras since then, right up to the present day. It has also been imitated by composers such as Tomaso Albinoni, Francesco Gasparini, Leonardo Leo and Martini il Tedesco. 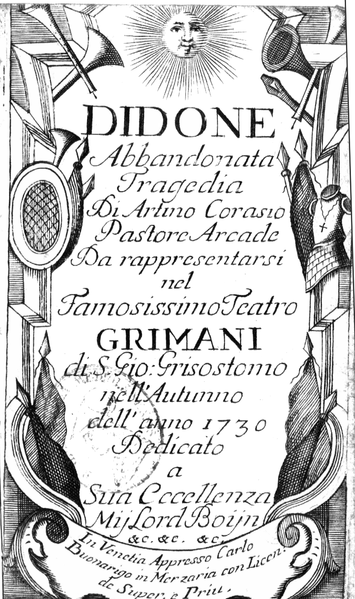 Sarro’s 1726 opera, Valdemaro, is considered important because it demonstrates Sarro’s interest in the upper voice, as in this opera the melodic lines are dominant in the upper voices. Sarro, sometimes called Sarri, also wrote many vocal cantatas, which have been admired by music experts for their charm and inventiveness. The only known portrait of Domenico Sarro is part of a painting called The Viceroy at the Festa of the Quattro Altari by Nicolò Maria Rossi. Sarro is one of the many composers depicted by the artist as part of the Neapolitan Court. Domenico Sarro died in Naples in 1744, aged 65. The port of Trani, where Domenico Sarro was born, is about 40km (25 miles) to the northwest of Bari. It was a flourishing port as early as the 11th century because of its location on the Adriatic Sea. In 1063 Trani issued a maritime law code, believed now to be the oldest in western Europe. Trani has lost its old walls and bastions but still has a 13th century fort, which has been restored as a museum and performance venue. The 12th century Cathedral on a raised site over the sea is dedicated to St Nicholas the pilgrim, a Greek who died there in 1094 while on the way to Rome. Sarro studied at the Music Conservatory when it was in Sant’Onofrio in Naples. Today, the Music Conservatory is in the complex of San Pietro a Majella, close to Via dei Tribunali, one of the main thoroughfares in the heart of the centro storico in Naples. It is the last of a string of establishments that were once music conservatories in Naples, dating back to when the Spanish ruled the city in the 16th century. One of the earliest, I Poveri di Gesù Cristo, was founded in 1589 by Marcello Fossataro, a Franciscan monk. It was next to the Church of Santa Maria a Colonna on Via dei Tribunale, but in 1743 it was converted into a church seminary. Carla Bruni, the model and singer who became the wife of French president Nicolas Sarkozy, was born on this day in 1967 in Turin. She and Sarkozy were married in February 2008, just three months after they met at a dinner party. 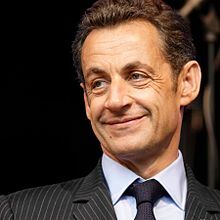 Sarkozy, who was in office from May 2007 until May 2012, had recently divorced his second wife. Previously, Bruni had spent 10 years as a model, treading the catwalk for some of the biggest designers and fashion houses in Europe and establishing herself as one of the top 20 earners in the modelling world. After retiring from the modelling world, she enjoyed considerable success as a songwriter and then a singer. Music remains a passion, her most recent album released only last year. To date, her record sales stand at more than five million. Born Carla Gilberta Bruni Tedeschi, she is legally the daughter of Italian concert pianist Marisa Borini and industrialist and classical composer Alberto Bruni Tedeschi. However, she revealed in a magazine interview soon after she and Sarkozy were married at the presidential residence the Élysée Palace in Paris, that her her biological father is the Italian-born Brazilian businessman Maurizio Remmert, who was a classical guitarist when he met Marisa Borini at a concert in Turin. They embarked on an affair that lasted six years. Even without her two successful careers, Bruni would have been a wealthy woman. Through her legal father, she is heiress to the fortune created by the Italian cable manufacturing company CEAT, founded in the 1920s by his father, Virginio Bruni Tedeschi, which subsequently moved into tyre production and is now based in India. 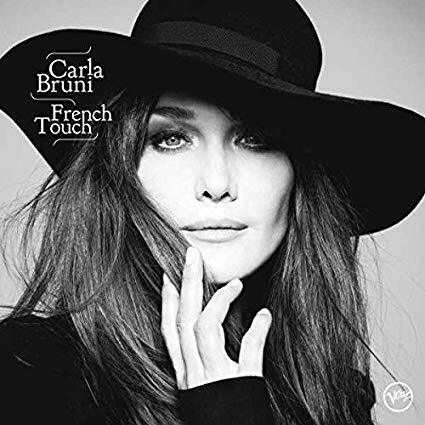 Carla Bruni has lived in France from the age of seven, the family having left Italy in 1975 over fears they would be a target for kidnap by the Red Brigades, the left-wing terrorist group who kidnapped many wealthy or politically important individuals in the 1970s and 80s. She was educated initially at a boarding school in Lausanne, Switzerland, before returning to Paris to study art and architecture at the Sorbonne, although in the event she left school at the age of 19 to become a model. Bruni signed with a prestigious agency in 1987, and after being selected for an advertising campaign for jeans manufactured by the American company Guess?, soon began to attract attention. Over the next few years she worked for designers and fashion houses including Christian Dior, Givenchy, Paco Rabanne, Yves Saint-Laurent, Chanel and Versace. At her peak, with her image appearing on billboards and magazine covers constantly, she was earning up to $7.5 million (€5.44 million) a year, which put her among the 20 highest-paid fashion models in the world. Bruni enjoyed a jet-set lifestyle and dated some of the world's most famous men, including veteran rockers Mick Jagger and Eric Clapton. The love of music instilled in her as a child never left her, however, and in 1997, at the age of 30, she retired from modelling to focus on her music. She had always played the guitar and started singing lessons. She sent her lyrics to the French singer Julien Clerc in 1999, which he used as the basis for six tracks on his 2000 album Si j'étais elle. Her own first album, Quelqu'un m'a dit (Someone Told Me) was released in 2003 and was a surprise hit, selling more than a million copies. It spent 34 weeks in the top 10 of the French albums chart. Several songs featured in movies or television commercials. She has since released four more albums and written songs for other artists, including the rock guitarist Louis Bertignac. In her second album, No Promises, she set to music poems by William Butler Yeats, Emily Dickinson, W. H. Auden and Dorothy Parker among others. Although Sarkozy represents the centre-right Republican party, Bruni’s own political leanings were to the left before they were married, although her status as First Lady gave her no powers and generally she has was careful to avoid being drawn into political debate. She has used her profile to support a number of charities, particularly those concerned with protecting mothers and children and fighting HIV. 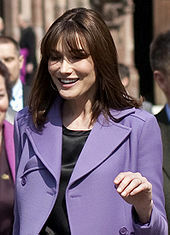 In 2009, launched the Fondation Carla Bruni-Sarkozy, to promote access to culture and knowledge. Bruni has been more outspoken on matters related to her charitable work. She has been critical of the Catholic Church for continuing to oppose the use of condoms - a proven way of limiting the spread of AIDS - even though the church spends millions of dollars on caring for HIV/AIDS patients. She and Sarkozy are the parents of a girl, Giulia, who was born in 2011. Bruni has a son, Aurélien, from a previous relationship with philosophy professor Raphaël Enthoven. 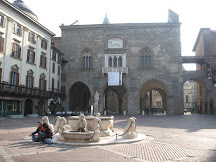 Bruni’s father, Alberto Bruni Tedeschi, came from Moncalieri, a town of almost 58,000 inhabitants about 8km (5 miles) south of the centre of Turin and part of the greater metropolitan area. 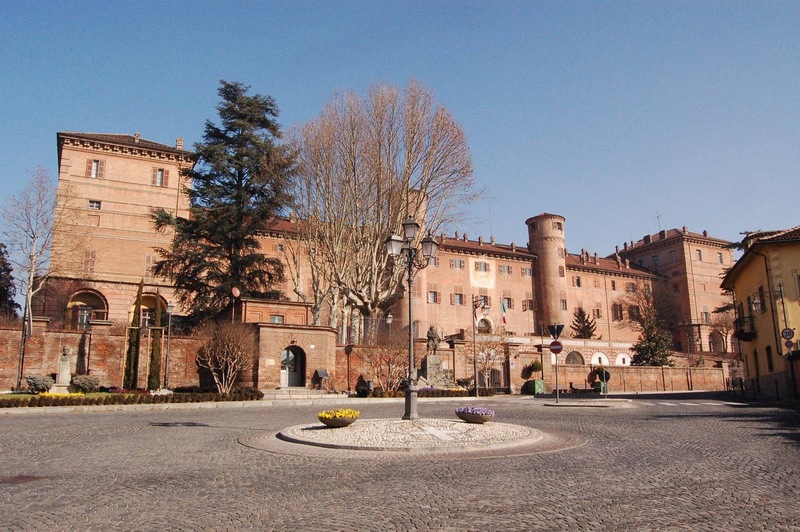 It is notable for a 12th century castle, enlarged in the 15th century, which was for a time a favoured residence of Maria Clotilde and King Victor Emmanuel II of Italy and now is listed among the World Heritage Site Residences of the Royal House of Savoy. Since 1919 it has housed a school for training carabinieri officers. The city of Turin, the traditional seat of the Savoy dynasty, is an elegant city with several royal palaces, a 15th-century cathedral that houses the Shroud of Turin and a city centre with 12 miles of arcaded streets, dotted with historic cafés an fine restaurants, many to be found around the Via Po, Turin’s famous promenade linking Piazza Vittorio Veneto with Piazza Castello, or nearby Piazza San Carlo, one of the city’s main squares. In the 19th century, the city’s cafès were popular with writers, artists, philosophers, musicians and politicians. One of the city’s major landmarks is the Mole Antonelliana, at 167.5 m (550 ft) the tallest unreinforced brick building in the world. Originally built as a synagogue, the building is now home to a film industry museum, the Museo Nazionale del Cinema. Mole is an Italian word for a building of monumental proportions.